Those now subject to asset freezes, and a travel ban, under Council sanctions resolutions and measures relating to Libya, include the head of a regional coast guard unit in Libya, according to reports, as well as two Eritrean nationals. The unprecedented sanctions against the leaders of trafficking networks, follow widespread international outrage at the end of last year, when the CNN television network broadcast pictures of migrants being auctioned off in a modern-day slave market, in the suburbs of the Libyan capital. “There must be accountability for exploitation and human rights abuses,” he added. Libya has become a major conduit for human trafficking, especially from sub-Saharan Africa, since the overthrow of former leader, Muammar Gadaffi, in 2011, which saw the country descend into factional conflict, widespread instability and a humanitarian and economic crisis. Figures from the African Union suggest that between 400,000 and 700,000 migrants were being held in often inhumane conditions, and subject to human rights abuses, in more than 40 detention camps across the country, as of last December. Fitiwi Abdelrazak, who also leads a network responsible for trafficking and smuggling tens of thousands, according to the committee, identified sources in criminal investigations as “one of the top-level actors responsible for the exploitation and abuse of a large number of migrants in Libya.” He is also said to have accumulated “immense wealth” through people trafficking. Wide view of the Security Council meeting on the situation in Libya. 06 June 2018. How do Security Council sanctions work? Sanctions are meant to be a last resort when it comes to addressing massive human rights violations, curbing illegal smuggling or curbing extremism groups. Increasingly, sanctions are also being used to support peace efforts, to ensure that elections are held, or to demobilize armed groups. Sanctions Committees are subsidiary organs of the Security Council and are composed of all 15 of the Council’s members. Their role is to implement, monitor and provide recommendations to the Council on particular sanctions regimes. They meet regularly to consider reports from expert panels and to hold meetings with Member States, UN actors and international organizations. 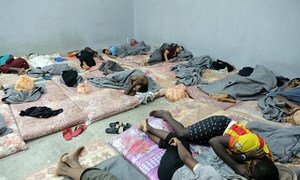 More than a dozen people have been killed or wounded by traffickers as they attempted to flee a detention centre in Libya last month, the UN refugee agency, UNHCR, said on Friday, describing it as the “latest horror story” to emerge from the war-torn country. 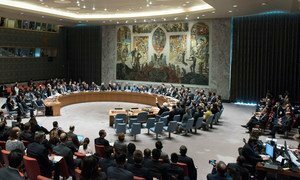 Counter-terrorism and non-proliferation are on the agenda today at the Security Council, where at least seven sanctions committees will brief the main United Nations body responsible for maintaining international peace and security. We’ve prepared a quick snapshot covering the basics of UN sanctions and how Sanctions Committees work.